Connor Graham of Ruth’s Baseball Ideals (RBI) Baseball Club (Annapolis, Md.) 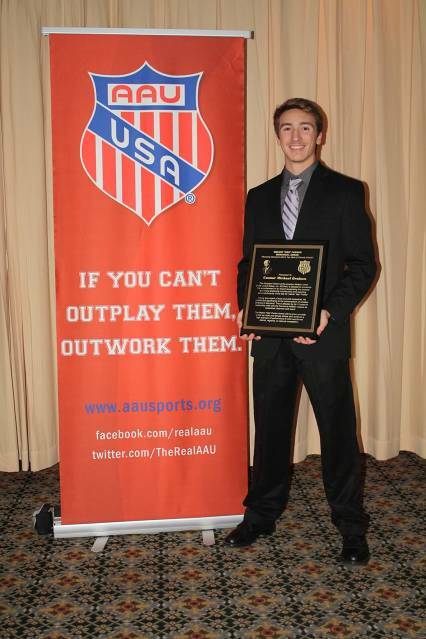 has been named 2015 Maryland AAU Male High School Athlete of the Year in all AAU sports. Maryland AAU District Governor Ben Dubose surprised Graham with the 2015 Melvin “Mel” Parker Award presented annually to the top male and female athlete in Maryland who achieves a high standard of performance in AAU sanctioned district, regional, or national competition. The award is presented to the two individuals, under the age of 18, in recognition of their commitment and achievement in their individual or team sport. The honor was conceived as a way to focus attention on their participation in athletics, school and community activities, and qualities of leadership, character, and sportsmanship.